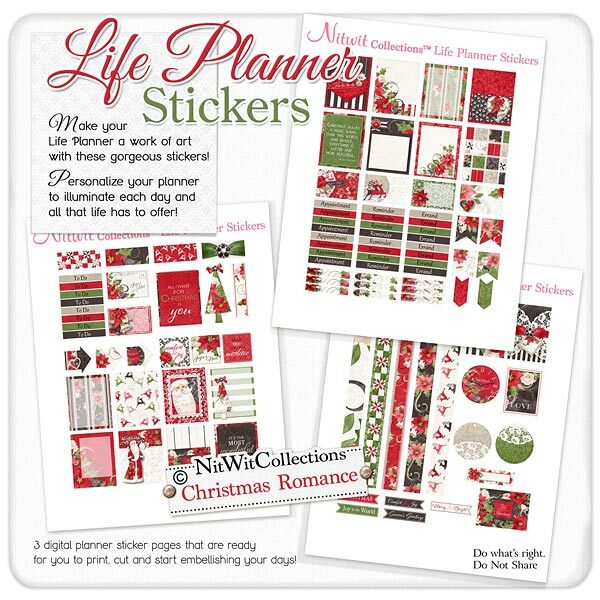 "Christmas Romance" Life Planner Stickers brings an air of sophistication and elegance to your life planners for the Christmas month of December! Bold colours, stylish elements and even some sparkle will unfold when you open the folder of this digital Christmas life planner sticker kit. 17 - 1.5" x 1.9" full boxes - writeable areas, Christmas sayings, and designed with the traditional Christmas images these are sure to make your planner pages pop! 8 - Appointment digital stickers...like meeting Santa! 2 - Arrow elements pointing to some important date, event, etc. 3 - Arrow elements that are more that just a sticker to point to a time, date or day, these are stunning stickers to just decorate with! 1 - Scalloped edge stamp - "Christmas Love"....who's the love that you'll be spending Christmas with?? 1 - Square sentiment sticker that is dressed in the striking black and poinsettia paper and wishing you a "Very Merry Christmas"